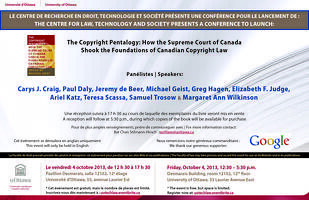 Registration for the conference on the Copyright Pentalogy: How the Supreme Court of Canada Shook the Foundations of Canadian Copyright Law is now open. The conference is scheduled for Friday, October 4th from 12:30 to 5:30 with a reception to follow. There is no cost for the conference, but advance registration is appreciated. Speakers include Carys Craig, Paul Daly, Jeremy deBeer, Greg Hagen, Elizabeth Judge, Ariel Katz, Teresa Scassa, Sam Trosow, and Margaret Ann Wilkinson.